Benjamin Budd's Tavern, 11.2 m., (L), now a private residence, was built about 1800 on the site of the cabin of David Brainard (1718-47), Indian missionary. (TheOldLibrarian - the Indians would have been the Mohicans, whose homeland this area was. 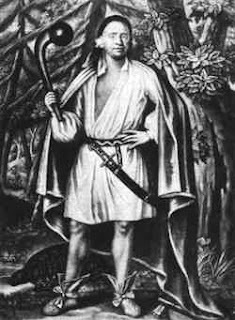 Pictured here is Mohican chief Etow Oh Koam). At Nassau, 16.1 m., when legal obstructions can be circumvented, greyhound races are run at the Rensselaer County Fairgrounds. Tickets for admission are distributed profusely without charge ; the large profits are made from betting. The course is sometimes run with monkeys astride the dogs. Skirting the Hudson Valley fruit belt, at 20.9 m. US 20 unites with US 9. At 24.1 m. is the junction with US4. At 29 m. the route bears L. on the Parker Dunn Memorial Bridge.